Archaeopteryx is one of the most important fossils ever discovered. It is a bird from the Upper Jurassic, about 150 million years ago. It shows the evolutionary link between theropod dinosaurs and birds. 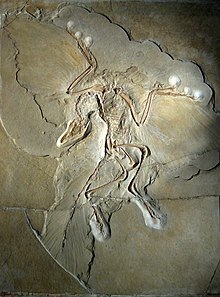 The first Archaeopteryx was found in 1860 near Solnhofen in Bavaria, Germany. Today, ten skeletons and one feather of Archaeopteryx have been found. Archaeopteryx looked like a small carnivorous dinosaur with wings and feathers. It had a mouth with teeth, claws on the hands and a long tail. Today, it is known that dromaeosaurs, and possibly most theropods, looked like birds and that many had feathers. When they are born, today's South American hoatzin have claws on their wings when they are young, just like Archaeopteryx. 2.1 Directly ancestral or not? Thomas Henry Huxley ("Darwin's bulldog"), who was a comparative anatomist, made a study of this nearly 150 years ago. He compared Archaeopteryx with a small theropod dinosaur, Compsognathus. These two fossils came from the same place: Solnhofen in Bavaria, Germany. The strata come from the end of the Jurassic period, about 144 million years ago. He showed that the two were very similar, except for the front limbs and feathers of Archaeopteryx. Huxley's study showed the basic relationship between birds and reptiles. He united them under the title of Sauropsida. His papers on Archaeopteryx and the origin of birds were of great interest then and still are. Huxley concluded that birds evolved from small carnivorous dinosaurs. Only one dinobird has been found from a time before Archaeopteryx. It is called Anchiornis huxlei, from 160 to 155 million years ago. It had feathers on both front and rear legs, and could certainly glide. It may or may not have had some ability to fly. This discovery means we cannot say Archaeopteryx is the first known bird, but its contribution to science has been huge. We now know for sure that a whole group of small theropod dinosaurs had feathers, and that flight was a later, secondary, use of feathers. The first use of feathers was temperature regulation, and probably also signalling (see Epidexipteryx). It may be that Archaeopteryx is not directly ancestral to all birds, but it is still a fine transitional fossil. "Archaeopteryx, for example, is not necessarily directly ancestral to birds. It may have been a species on a side-branch. However, that in no way disqualifies it as a transitional form, or as evidence for evolution. Evolution predicts that such fossils will exist, and if there was no link between reptiles and birds then Archaeopteryx would not exist, whether it is directly ancestral or not".